We have come to the end of our first term. The children have worked incredibly hard and have really earned their Christmas break. We wish everyone a Merry Christmas and look forward to seeing you all again in 2016. What a fantastic day at Segedunum today. We learnt so much in one day including how to be a Roman soldier, life in a Celtic village and we even made Celtic bracelets. Look in the gallery at the bottom of this page at all the photos. We loved doing some more collaborative problem solving in maths. This time using skills learnt for column addition. Across the school almost 87% of our pupils currently achieving their age related expectation from year 1 to year 6 in reading, writing and maths. By the end of December we are aiming to have almost 90% of pupils at their age related. Lots of fun was had today making Roman catapults with Technology Tom. We were brilliant Roman engineers with some great team work on display. We also showed how good we were at writing numbers in Roman numerals and then we made a Roman numeral clock. 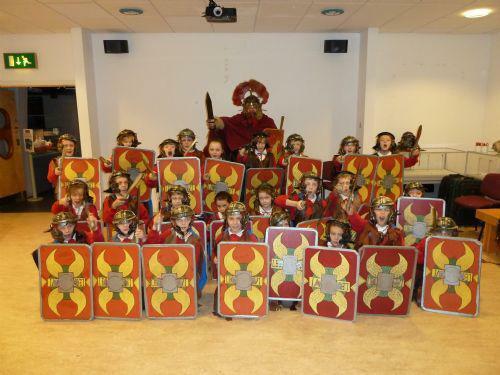 We are really looking forward to finding out more about the Romans when we visit Segedunum next week. More photos in the gallery at the bottom of the page. We love to learn songs and rhymes in French. We can write some simple sentences in French too. 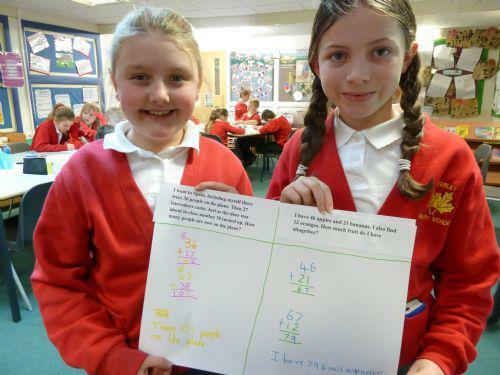 Lots of fun was had last week solving word problems in Maths. We used our multiplication skills alongside RUCSAC word problem solving skills to solve the problems. We also demonstrated how we can successfully work together. Is it a solid, liquid or gas? This was the question we were answering in Science last week. Lots of discussion and debate. In History we were trying to identify what the Celtic artefacts were and what they might be used for from the photographs. Work has finished on 'Stone Age Boy'. Our next book is 'Cliffhanger' by Jacqueline Wilson - watch this space! Check out the gallery for more photos too. We were very lucky today to have a visit from Faye Hanson the author of an incredible picture book called 'The Wonder'. We had a go at drawing one of her characters with her and then drawing our own versions of his 'wonders'. Lots of work has been going on in class and you can get a taste of all the work from the photos below.Take a look also in the gallery to see how we used Skittles to try and understand equivalent fractions. We also had lots of fun making our own Stonehenge models. Welcome back to the second half of the Autumn term. Watch this space to find out what we will be doing. A quick reminder that reading books and reading record books should be returned daily. P.E kits should be kept in school until the next holiday as P.E will mainly be on either Wednesday or Monday this half term. Library books should be returned for changing on Mondays. If you want to look back at what we were doing last half term then take a look at the gallery or alternatively at the archived page below. Homework is given out on Friday for both Maths and English and must be returned by the following Tuesday. Reading books chosen by the children, accompanied by a Reading Record book, are also brought home and must be returned daily. Could you please encourage your child to write a comment about the book that they have read? PE will be either on Monday or Wednesday and the children must have a PE kit in school including trainers. I have suggested to the children that they bring their PE kit on the first day of term and take it home at the end of each half term so that it is always in school.